LIKE thousands of his countrymen, Palitha plunged deep into debt for a gruelling passage to a first-world job and the chance to buy land and a home for his family. A decade ago, a relatively paltry $2500 bought him a fake passport and a terrible 52-day boat journey from Sri Lanka’s west coast — not to Australia, but to Italy. “I went because of the economy. Everyone went to Italy then, but now Italy is closed so people go to Australia,” the 50-year-old Colombo-based driver tells The Australian. This week, the federal government took the most definitive steps in years towards closing the loopholes that made Australia the obvious alternative for Sri Lankan migrants when the Italian route got too hard. More than 1500 Sri Lankans have reached Australian territory by boat so far this calendar year — already seven times higher than the total for all of last year — though the Sri Lankan navy’s recent crackdown foiled more than 500 last month alone. Desperate to stem the tide, the government was last night preparing tough new legislation based on the Houston report’s 22 recommendations, which focus heavily on removing incentives for those thinking about getting on a boat. The key recommendations include reopening Nauru and Manus Island offshore processing centres, extending visa waiting times and, perhaps crucially, making it harder for successful asylum-seekers to obtain family reunion visas. In counterbalance, the number of humanitarian visas available each year to refugees applying through traditional channels will rise to 20,000. Julia Gillard confirmed yesterday that not only would asylum-seekers be sent to tent camps in Nauru as early as next month, but they could expect to wait up to five years for their applications to be processed — similar to the waiting time faced by many refugees who apply through formal channels. Will the new strategy work? Apparently not on Sivanesaraghan, a 32-year-old from the depressed eastern Sri Lankan fishing region of Batticaloa. The aspiring photographer has only just returned home after his attempt to reach Australia by boat was foiled late last month by a broken clutch plate on the high seas and a fortuitous rescue by a French supertanker. Sivanesaraghan was one of 28 asylum-seekers transferred in a dramatic mid-ocean operation from the Euronav merchant ship to a Sri Lankan navy cutter. The whole exercise was highly dangerous, hugely traumatic and criminally expensive, yet he is unfazed by news of Australia’s new policies. 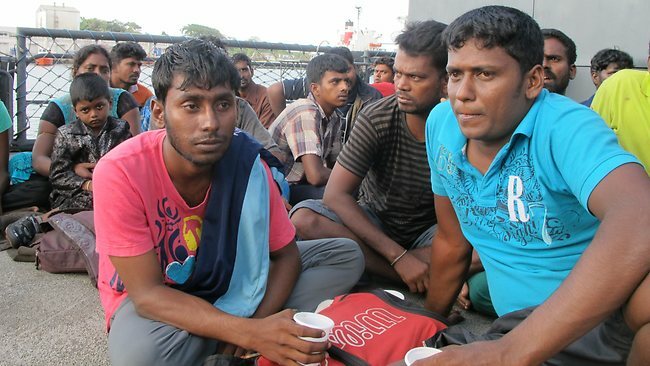 That should be no surprise to Sri Lankan navy operations director Commodore N. Attygalle, who supports moves to increase the number of humanitarian visas for applicants who go through the formal channels, but warned this week that asylum-seekers were unlikely to be dissuaded by the prospect of offshore processing. The advantages of remote screening are not lost on the Australian government, which is facing a particularly vexing problem — and ongoing court battle — over what to do with a growing number of detained Sri Lankan refugees who, it accepts, have a genuine fear of persecution but who ASIO deems too great a security risk to be released into the Australian community. Sri Lankan Jesuit priest Father Yogeswaran, who runs a human rights centre from the Tamil Tigers’ former eastern bastion of Trincomalee, which has seen large numbers of asylum-seeker departures, says the tough new stand might work, but only if the news comes from Australia. For the Australian government, and many Australians, the sudden rush of Sri Lankan asylum-seekers is mystifying. The country’s crippling 26-year civil war ended in 2009 when the military encircled and then crushed the last Tamil Tiger resistance on a strip of sand in the north. While the Sri Lankan government still carries the stain from its final military push, which caught thousands of civilians in the cross-fire, it has made attempts at national reconciliation and is de-mining and rebuilding the former rebel-held north and east. But for Sri Lankans — be they Tamil or Sinhalese, Muslim, Hindu, Buddhist or Catholic — there is no mystery behind the desire to escape. Migration is a rite of passage in this island nation, whether for domestic service in the Middle East or refugee status in Australia, and professional people-smuggling businesses have flourished by feeding that desire. “Regardless of their political views and personal financial conditions, I have met very few young Sri Lankans who wouldn’t migrate if given the opportunity,” says Bernardo Brown, a Cornell University PhD student who spent a year in Sri Lanka’s west coast community of Negombo researching local migration patterns. Not to diminish the “perilous and volatile conditions” faced by those still living in the Tamil-dominated north and east, Brown says the almost universal desire to leave reflects “the poor conditions, demoralising and hopeless image that many Sri Lankans hold of their country”. Many are struggling as the country makes its difficult transition from a war to peacetime economy. Unemployment in the north and east is particularly rampant. Gang violence, smuggling and sexual assaults are also growing problems there — despite the continued militarisation of those zones, itself troubling for many Tamils who fear the military. Mass displacement is a major issue because of the war’s destruction of homes and land title records and, controversially, the government’s decision to revoke longstanding permits to some farm land in the east in the interests of development. The UN High Commissioner for Refugees acknowledges thousands of Sri Lankans will need humanitarian aid for years. Human Rights Watch says reconciliation efforts between the Sinhalese government and the country’s Tamil minority remain “slow at best”. The question is: after three years of peace, are conditions still so bad in Sri Lanka that so many Tamils can lay legitimate claim to refugee status? The federal government appears not to think so. Last month, to the dismay of the Sri Lankan Tamil diaspora and the delight of Sri Lankan authorities, which have demanded tougher action from Australia, it deported Dayan Anthony, the first failed Tamil asylum-seeker returned since the end of the war. More are expected. Its decision to do so, despite the man’s claims of torture by Sri Lankan authorities, was a clear message to other hopefuls. Within 24 hours of his deportation, he had recanted all claims at a government press conference. Like many failed asylum-seekers, he said he had been coached by an agent to claim abduction and torture, though his recantation is tainted by the fact it came after hours in custody and under the gaze of government Sri Lankan officials. Nishan de Mel, an Oxford and Harvard-educated economist, believes the sudden dramatic rise in Sri Lankans attempting to reach Australia is a symptom of the gradual opening up of the former Tamil Tiger-held north of the country. “A lot of people from the south have been leaving Sri Lanka for a long time, but it was hard to do that from the north and the east during the war because the coast was heavily patrolled by both the navy and LTTE (Liberation Tigers of Tamil Eelam),” de Mel says. For months, even after the war ended in May 2009, the region was closed to all but military and government officials, and only a select group of humanitarian workers were allowed into the massive IDP (internally displaced peoples) camps that served as emergency shelters and processing centres to filter Tigers from civilians. Though the camps were initially closed, they leaked like sieves. Hundreds of Tamils bribed their way out of confinement and ended up on planes or boats to Australia. By February this year more than 200,000 of 300,000 mostly Tamil civilians had legally left the camps, often returning to towns and homes destroyed. Another 1200 have left the camp this week to return to the recently de-mined Mullaitivu — an area synonymous with some of the bloodiest battles in the last months of the war. Aid and rebuilding continues, but not at the pace required given the depth of destruction. Thousands of Tamils are unwilling or unable to return, but the last remaining camp, Manik Farm, is set to close this month. That may well spur more boat hopefuls. De Mel argues that while many Tamil asylum-seekers may not be able to prove a refugee’s genuine risk of persecution, dismissing them as economic migrants oversimplifies their plight as victims of a war-induced humanitarian crisis. “Those leaving for economic reasons do so because they are living in significantly deprived conditions,” he says. Civilian returnees are not the only ones struggling to adjust. The government’s Tamil Tiger rehabilitation program has been praised for its attempts to reskill and reintegrate often forcibly recruited combatants. Yet even some military officials admit former rebels are subjected to intense monitoring. “They feel harassed and jobless,” a military intelligence officer tells The Australian. Of the 28 asylum-seekers rescued by the French Euronav last month, at least six were former Tamil Tiger soldiers who had passed through military rehabilitation camps. Perhaps the story most emblematic of the forces driving recent asylum-seekers is that of Mathusha Sivajalingham. The 36-year-old mother of two lost her husband to a landmine in 2006. Three years later she fled her home and her small tea shop when the war reached the rebel administration centre of Kilinochchi. The family lived for two years in IDP camps before returning to Kilinochchi to find everything gone. “In the space of two years I had lost everything I had rebuilt after my husband’s death,” Mathusha told a local paper. “The fighting not only cost me my shop but also the land. In all the chaos I lost the deeds to the land. There is no way of proving ownership and so I could not obtain a bank loan to rebuild.” Their attempt to reach Australia by boat was foiled by the Sri Lankan navy. Mathusa’s children are now living with relatives in Trincomalee. She is seeking work in the capital, Colombo. The government denies any attempt to manipulate the demographics, though it insists all Sri Lankan citizens have the right to live wherever they please. The trouble is, many Sri Lankans don’t want to live there at all. Father Yogeswaran says the sense of hopelessness continues to drive asylum-seekers in the face of innumerable risks and hardships. He warns that Australia’s tough new message could take some time to filter through. From behind the wheel of his late-model sedan, the Colombo driver Palitha says he would not try the boat route these days under any circumstances and would not allow any of his children to do so, either. But then, he has already made his money. He has already built his house.